Are DSLRs obsolete for 360 photos or virtual tours? 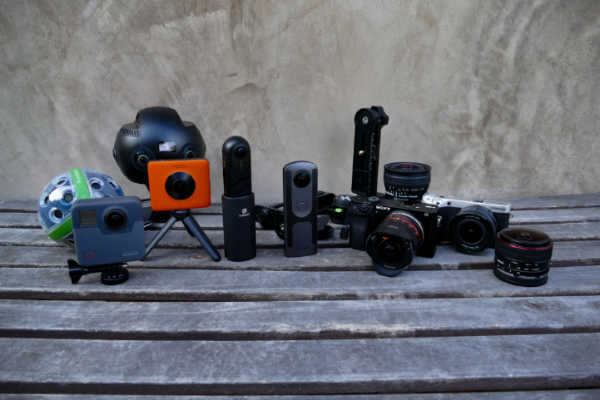 The best way to answer the question is by showing you some 360 photos from a DSLR (or ILC) panorama compared to some of the best 360 cameras for photography as of June 2018. Note: this comparison only compares image quality, and does not consider workflow or cost. For the DSLRs / ILCs, I used the following cameras and lenses. They’re only modest, so you can expect even better quality from higher end cameras. Sony a6000 – one of the most popular mirrorless cameras with APS-C sensors. Samsung NX500 – according to DXO, it has the highest quality sensor for mirrorless APS-C cameras. Here are samples from the cameras above. In addition, I’ve updated my 360 comparison tool to enable you to compare these cameras. Here are crops from the ‘front’ view of each camera (and the equivalent view for non-360 cameras). I’ve arranged them according to my assessment of their detail. For ease of comparison, I resized them to approximately the same viewing size, except the cameras with much higher resolution. Here are equirectangular views to show the dynamic range across the scene. Blown highlights are in red, while crushed blacks are in blue. Again, please see my updated my 360 comparison tool so you can see for yourself and arrive at your own conclusions. In summary, 360 cameras are much faster and more convenient to use than DSLRs for 360 photos. However, the obvious quality difference between a DSLR pano versus a 360 camera is just one of the many reasons some photographers continue to shoot 360 photos with DSLRs. To learn how to shoot a panorama with a DSLR and to learn the advantages, check out this tutorial. Great review, Mic!….happy Mi Sphere owner here, in Ireland! How does the Panono compare price wise with the DSLR and lens combos Mic? I think people using DSLR to achieve higher quality would more likely be looking to use a higher end 360 camera, maybe the new Aleta S2 will perform better when final firmware and software is in place… It will be interesting to see your comparison of the Panono with the Aleta. Hi Steve. Re price, it is possible to assemble an aps-c dslr and lens combination with panoheads, etc. for under $1000. I will compare that combination against the Panono and Aleta (if it’s ready) as soon as I get it from nodalninja. Will post the comparison asap. I started 360 photography with my DSLR (Canon 7DM2) and the quality is by far better than any low-mid end range 360 cameras but I ended up using a 360 camera because it is so much easier to user. With my DSLR I had to setup my tripod, my panoramic head, take 10-15 shots and then only stitch everything together. If I was earning money with 360 pictures, it would be a different story but as it’s not the case I went for a lower quality but a much easier process.